The Friday we cooked Fried Rice in my class I left school and ran errands. I wonder what went through the minds of those that passed me in the aisle at Publix. I’m sure they thought that I worked at some local Chinese restaurant or that I was too cheap to buy real perfume and just dabbed a lot of soy sauce behind my ear. I am not kidding you when I say that I had to roll the windows down in my car on the way home because the odor permeated every pore of my body. 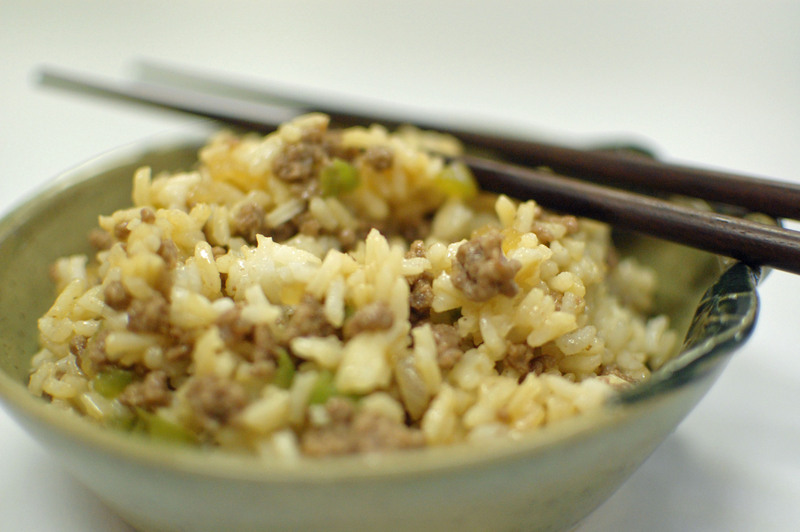 Just imagine 24 kitchens using sesame oil with a clove of garlic, ginger, onions, and soy sauce. The entire school smelled like a Chinese Wok by noon and we have a large school. This was a first, I had students checking out to go home and change clothes. The odor lingered in my room for weeks! Was the food good? Yes, it was, but I do need a much better ventilation system. Two large windows just does not cut it. Spinach, spinach everywhere! I have loved the beautiful spinach I am getting in my CSA box each week. It has been some of the best that I have ever had, but I cannot prepare this every week. I have to branch out and try something new,even though sitting down with a bowl of this would be quite rewarding. What did I come up with? It had to be something quick and a dish that could use some of my other CSA goodies, a gorgeous oyster mushroom and an onion. Anna’s rice pilaf recipe came to mind. It’s not her original recipe. I will share it at a another time. It is quite delicious. I used it as a side dish, but it could very well work as a main dish. I have been known to add a little soy sauce and eat a plateful. 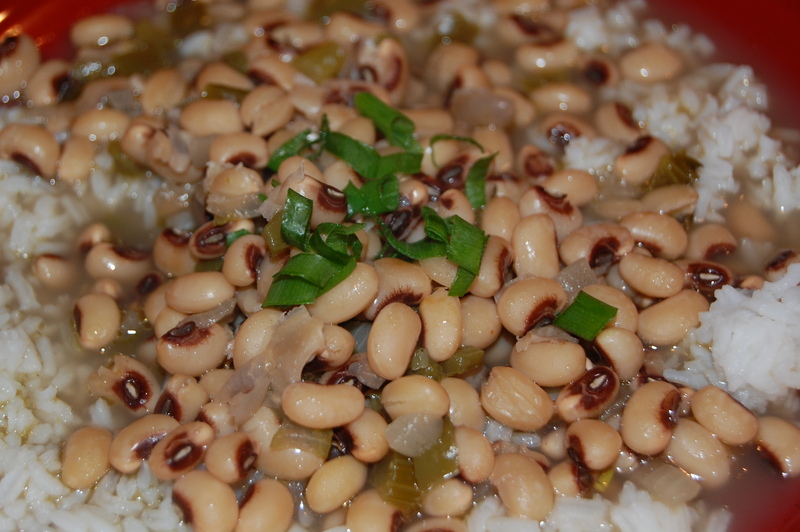 Hoppin’ John – Black-eyed Peas and Rice – Means riches for the new year! What are your traditions for the New Year? 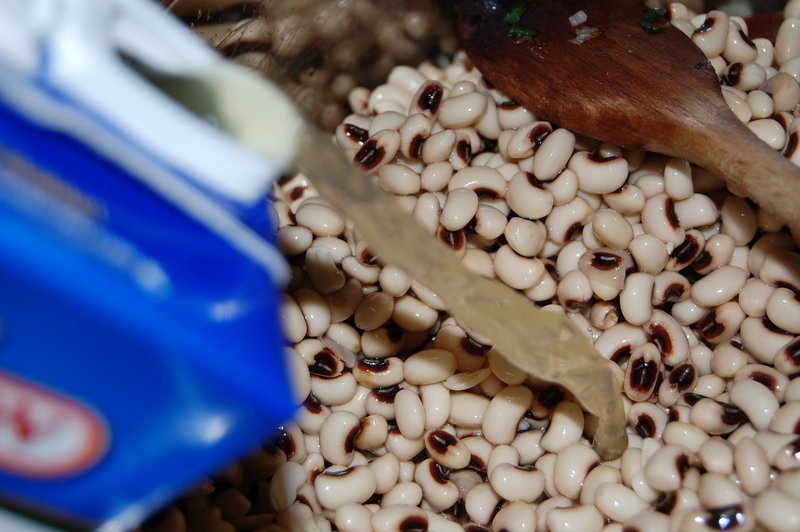 Do you eat certain foods for good luck in hopes of increasing your wealth ? 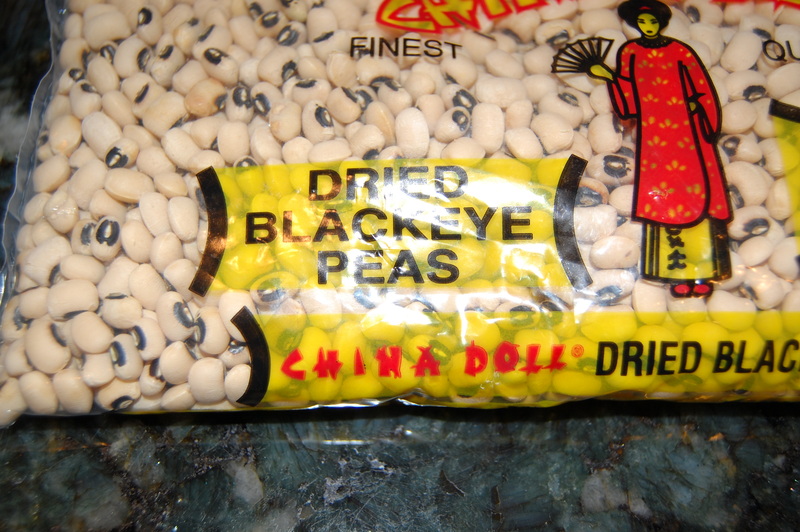 I have always had black-eyed peas and cabbage on New Year’s Day. It was for good luck for the rest of the year I was told. 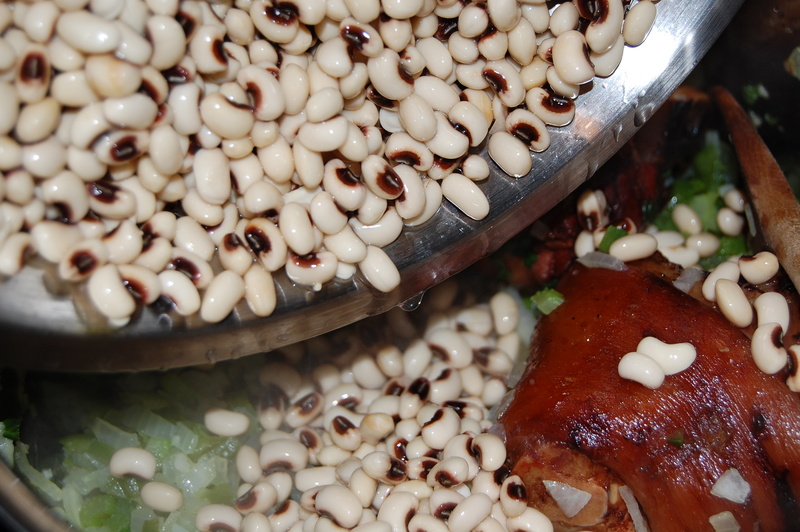 I love Hoppin’ John! 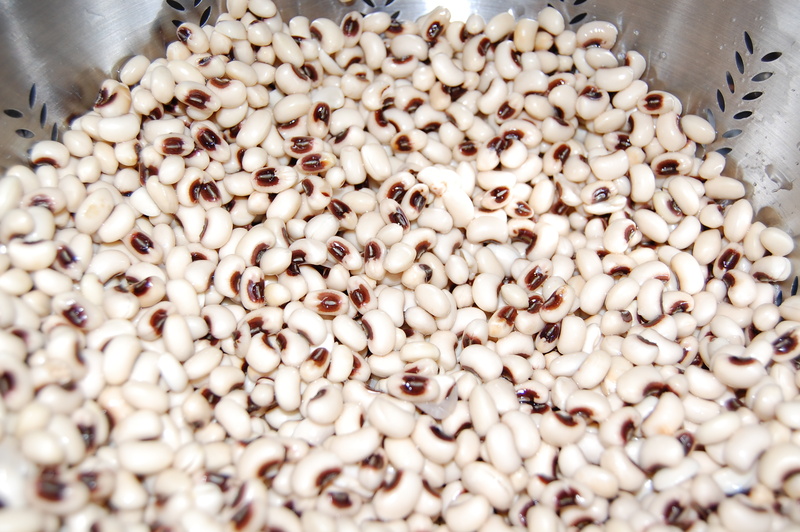 We were discussing food traditions in class one day and I mentioned Hoppin’ John and I was surprised that so few were familiar with the dish. History says it came from the Charleston , South Carolina area. The name from children hopping around the table before eating, or a saying ” Hop in John” meaning for a guest to sit down to eat or a cripple named John hawking peas on the streets of Charleston. I have been using Emeril Lagassse’s recipe since 2002. I love this stuff! But I am one of those that grew up eating butter beans over rice as a snack after school. It is very inexpensive to make. 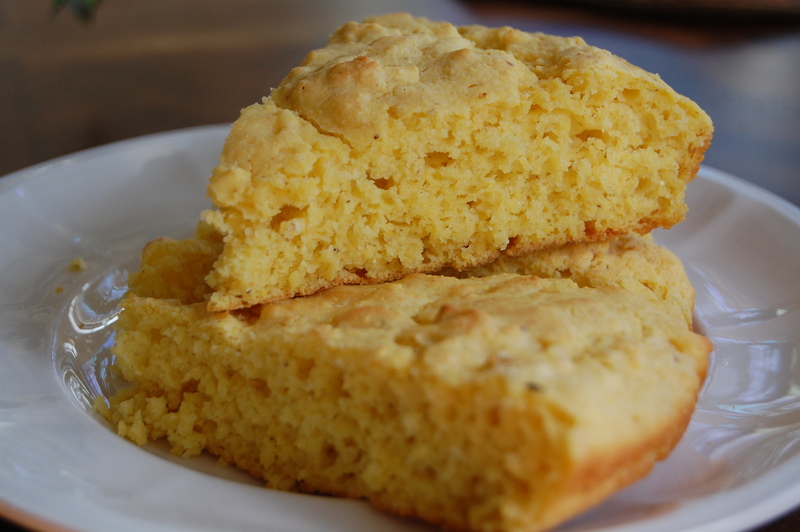 Pair it with some hot cornbread and it is better than dessert!! I like to make it a day ahead because the flavors develop. Anyway I am eating 365 peas for good luck and I am going to enjoy every one of them. These will have to be soaked overnight then rinsed. I have tried the shortcut method of boiling them first, but it just has never worked for me. Make sure that you put enough water because these little peas will double in size. That means a lot of water. After soaking all night then drain and rinse with cold water. Now it’s time to start cooking !! This one looked pretty scrawny to me so I seared 2 small ham hocks. 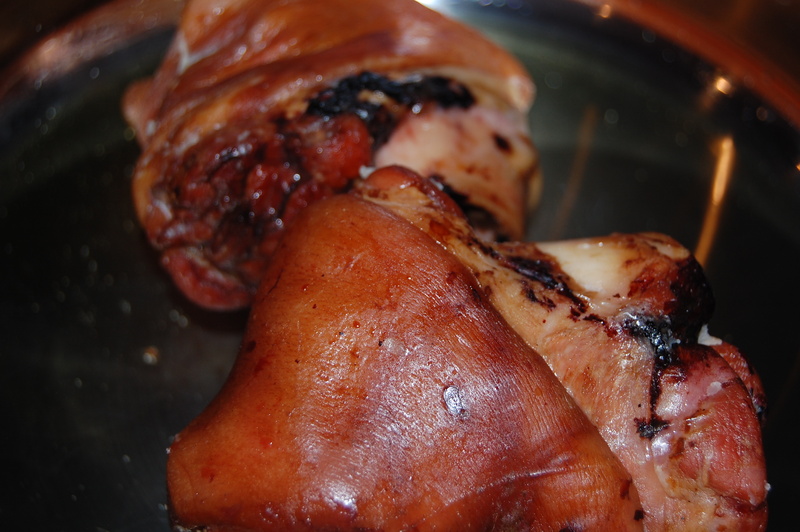 I really do not know how to judge the size of ham hocks. Use your best judgement here! 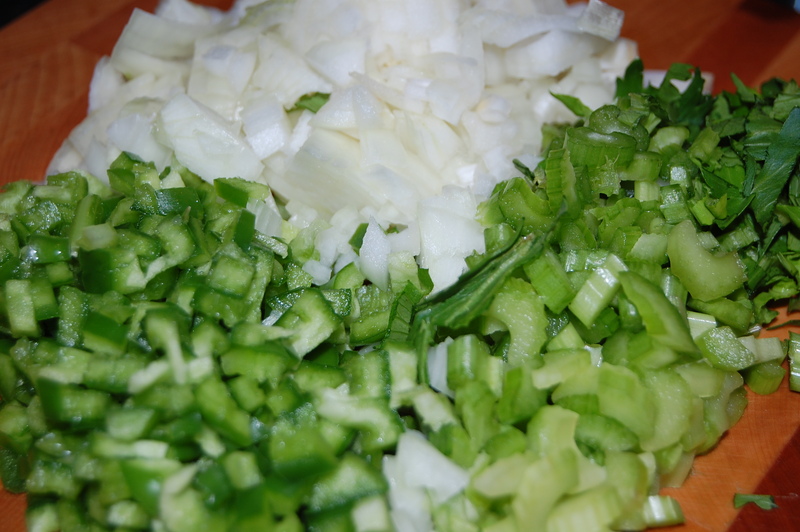 Add green pepper, celery, onion and garlic. Cook for about 4 minutes. Add seasonings now! Bay leaf, 2 teaspoons dried thyme leaves, salt, pepper and cayenne pepper to taste. Now be patient and let this simmer for about an hour or until the peas are nice and soft. Be careful not to use a really high heat because the boiling will tear the skins of the peas. You want the peas to be soft and creamy. Yummy!! 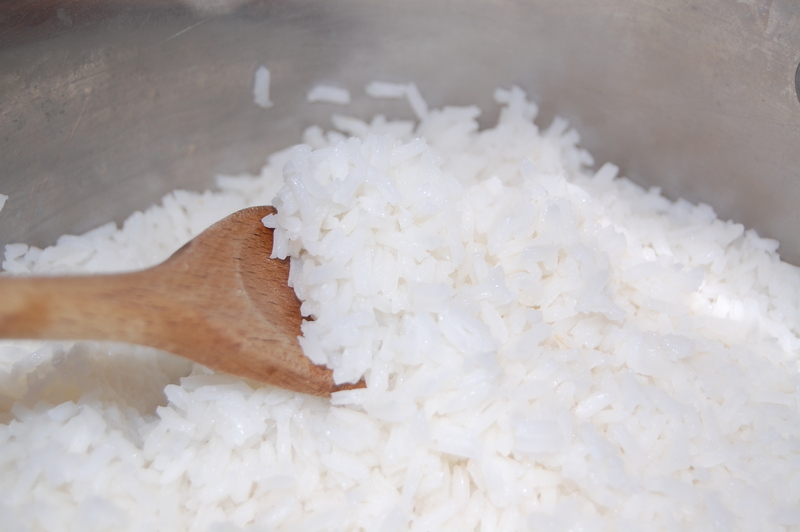 Follow the directions for cooking the rice that are on the package and you cannot go wrong. You will been 2 parts water and 1 part rice. 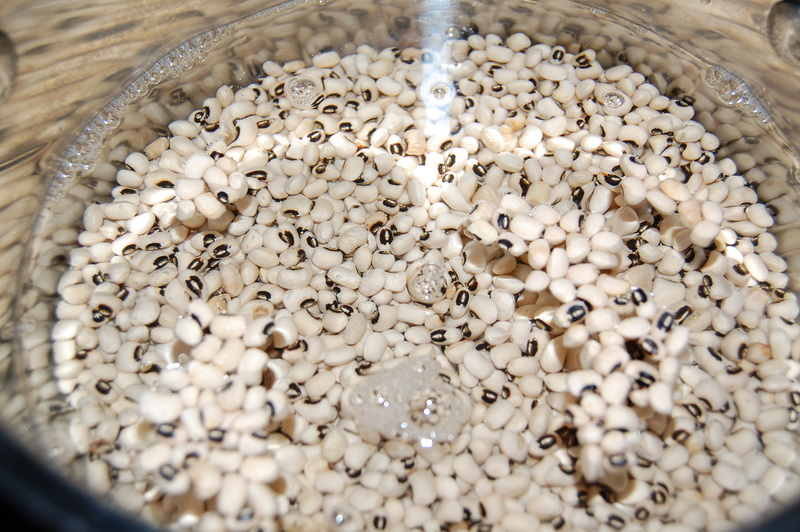 Bring 3 cups of water to boil and add 11/2 cups of long grained rice. Bring back to a boil and turn to simmer. Cover and cook for 20 minutes. Perfect! 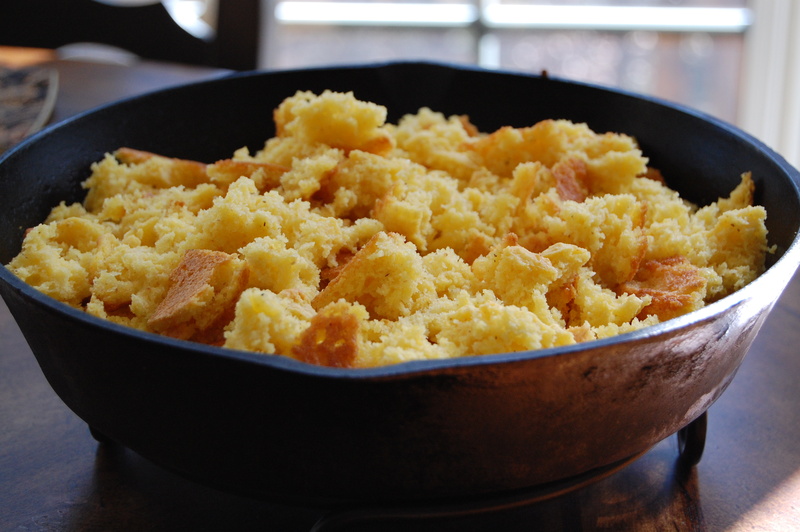 Now pair this with your favorite cornbread! You can crumble it up and add to the broth. 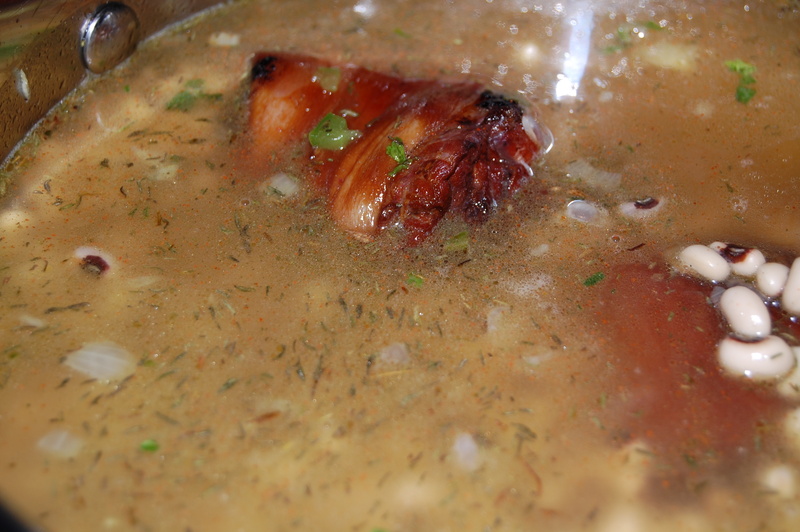 Heat oil in large soup pot, add the ham hock and sear all edges for about 4 minutes. 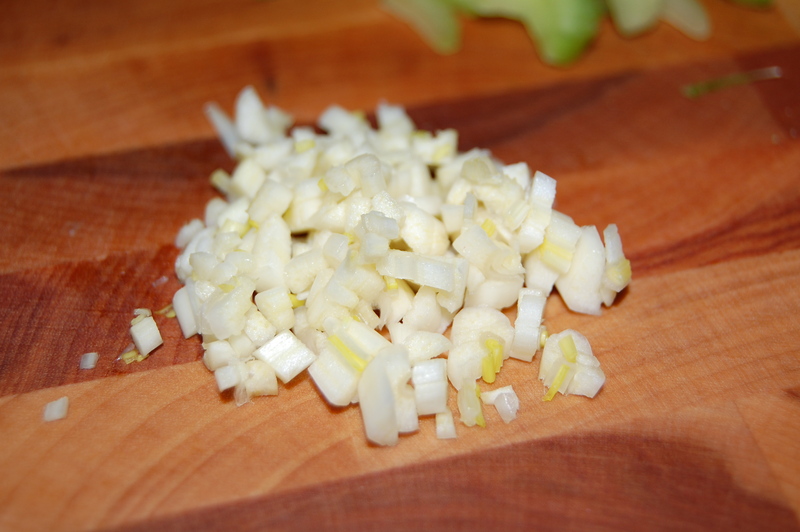 Add the onion, celery, green pepper, and garlic, cook for 4 minutes. 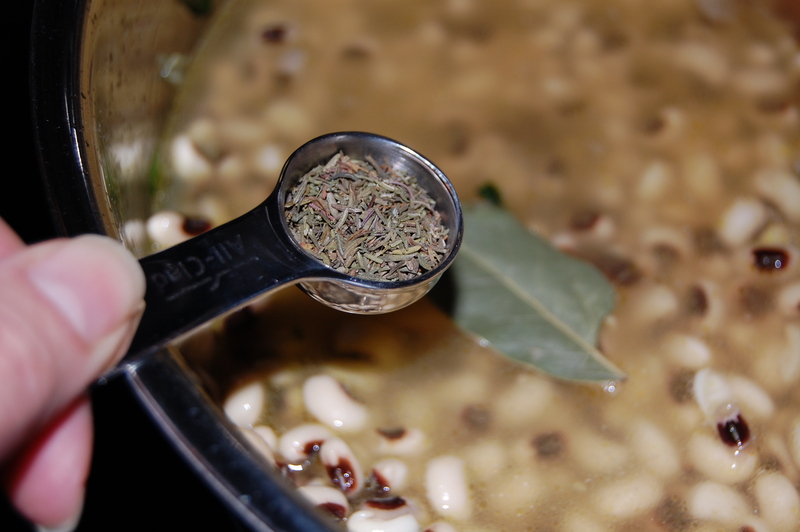 Add the black-eyed peas, stock, bay leaves, thyme, and seasonings. 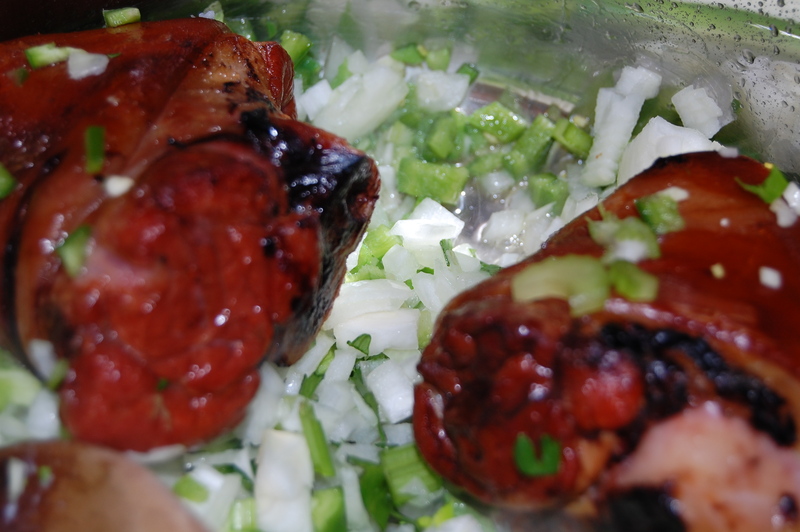 Bring to a boil, reduce the heat and simmer for about an hour until the peas are creamy and tender, stir occasionally. If the liquid evaporates add more water or stock. Adjust seasonings . I like to add Tobasco sauce for some heat! 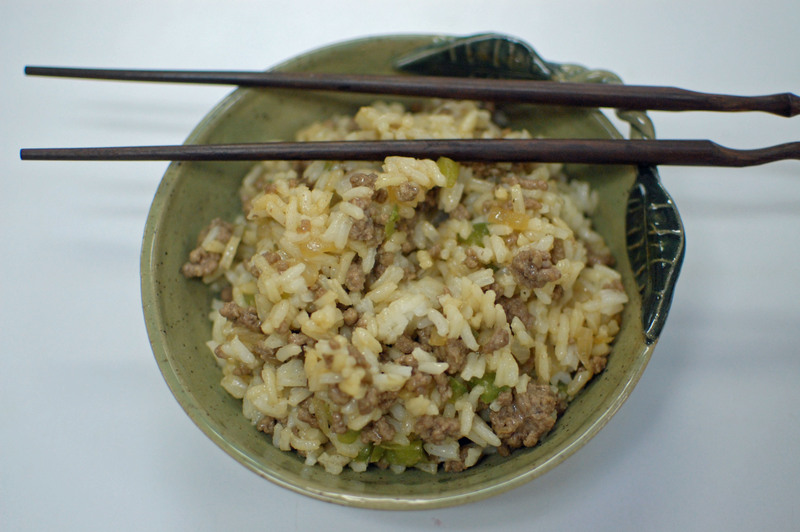 Serve over hot cooked rice and garnish with green onions.